Cats love the taste of meat and instinctively know what's good for them. If you give them quality meat they will appreciate it. The crunchy kibbles are carefully prepared to ensure your cat gets the most from their feed. Cereals, Meat and Animal Derivatives (10%*), Vegetable Protein Extracts, Oils and Fats, Derivatives of Vegetable Origin, Minerals and Yeasts, *Equivalent to 20% Rehydrated Meat and Animal Derivatives, with a minimum 4% Chicken and 4% Duck. Bought this for the ferels we feed at work. Was a really good buy on the offer. The cats love it. 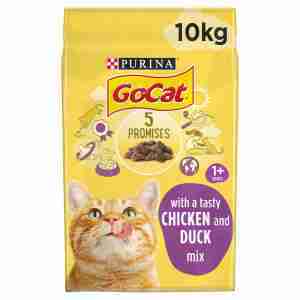 Complete cat food absolutely loved by my two cats. Meow at cupboard door to be fed more!